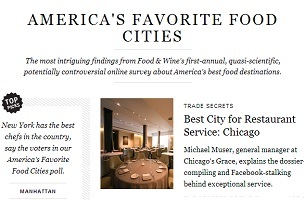 Food & Wine tags its first annual “America’s Favorite Food Cities” online survey as “quasi-scientific” and “potentially controversial.” Indeed, those two things tend to go together like a risotto’s mushrooms and finely shaved Parmesan. In the “Best of the Rest” section, Salt Lake City receives a couple of flagged mentions. 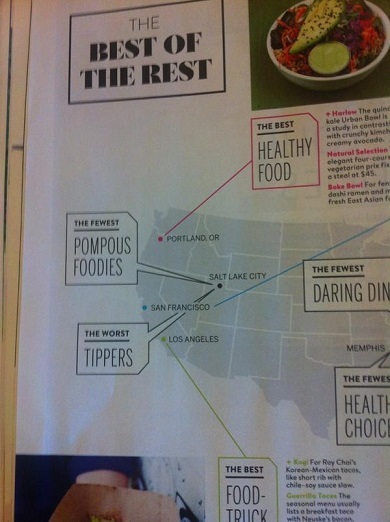 There, asserts the magazine, you will find both this country’s Worst Tippers and fewest amount of Pompous Foodies. The logical quasi-scientific conclusion is that pompous foodies, when satisfied, tip generously. Alas, on this front at least, most of them according to Food & Wine prefer to live in or visit NYC. Are you a pompous foodie? You probably don’t need a quiz to confirm what you already know. But… if you’re bored as you await that reservation tonight at an establishment FishbowlNY can’t possibly hope to get into, click here.